The view from C-YA crossing the Gobi desert! No trees for hundreds of kilometres. 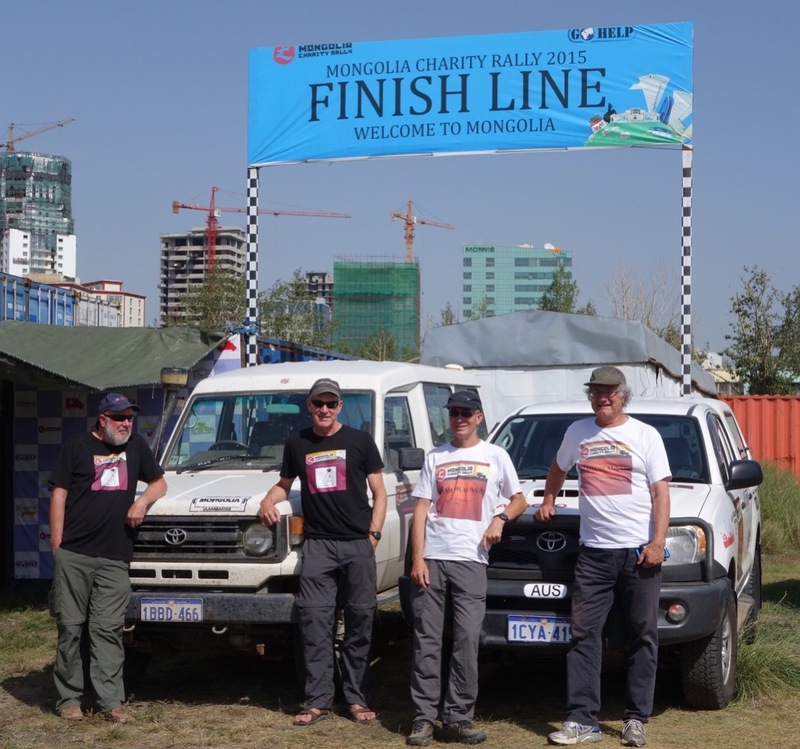 Ulaanbataar finish line:Today C-YA, carrying Andrew and Jeff crossed the official finish line! It was great to share this moment with our travelling partners, Team Quokkastan, Peter Le Souef and Mark Edwards in the Quokkavan! We made it!!!!! It was a feeling of triumph but also sadness, because our adventure is over and also we have said goodbye to our faithful Toyota Hilux, C-YA! We arrived early in the morning at the GoHelp office in UB central business district. 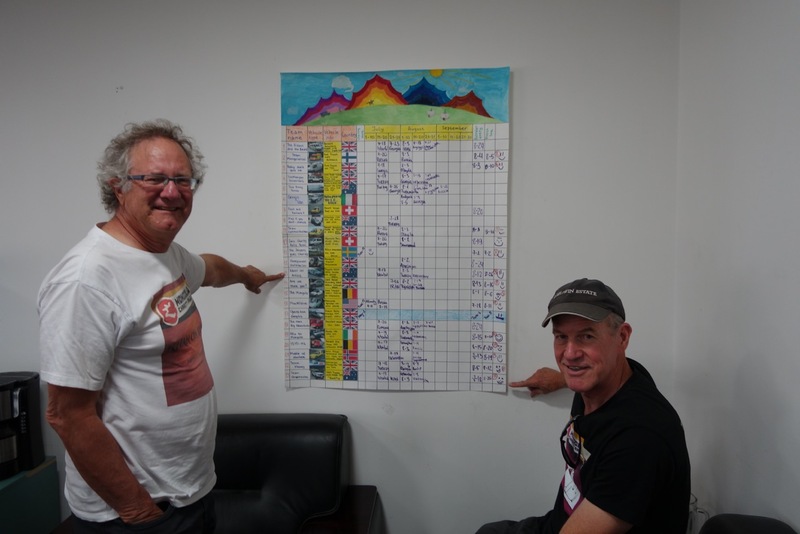 At the office we added our marks to the finishers on the chart, the 12th to finish. The official paperwork was completed to hand over C-YA to the charity. KOA also drew in the Charity Rally book, putting our feelings and emotions into colours! It was a short drive to the finish line where there was lots of shouting, shaking hands, high fives and presentation of our trophies! A few minutes after us the Swiss Charity Rally team drove through as well. It was terrific to share their triumph as well! We were then taken to see the Book Bus, one of the projects run by the charity to bring books and knowledge to the children of Mongolia! Tonight we meet with two other Charity Rally teams at a local Irish Pub (Yes, they are everywhere!) to celebrate the finish. Tomorrow morning, Andrew and Jeff jump on planes to return home! The adventure is over but the memories will linger. To have 4 friends spend over 7 weeks together, to be in close contact, the gut disturbances, the rough roads, the incredible scenery, the long days of driving, the basic accommodation and still look forward to the next experience and share it together is an incredible feat. We all feel very privileged to have done this together. It has created a special bond between us. To anyone contemplating such a journey, do it !. We did not have one moment of personal danger. Everyone we have met has been friendly and helpful. In fact, most went above and beyond the expected. The Kazak cafe owner who brought out samples of all the food he had, so we could choose, the Russian cafe staff who used google translate to explain what the various dishes were, the Mongol herders who came from no-where to welcome us, the home-stay families who made us feel amongst friends instantly, it makes you feel humble that these complete strangers are so welcoming. To Peter and Mark who travelled with us, thank you. It was great to have you there. 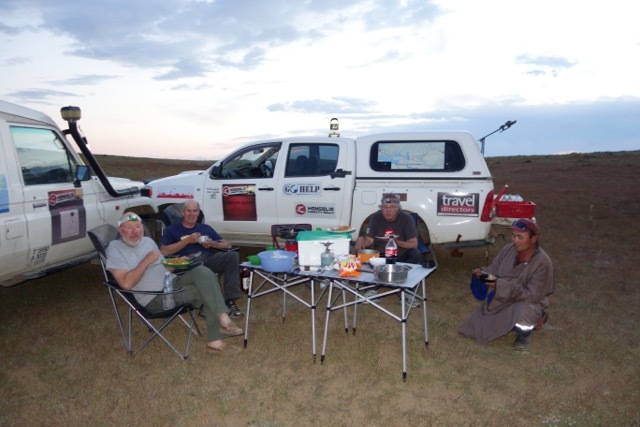 The nightly banter, the walkie-talkie chat, the help with the river crossings, Mark’s culinary skills, Pete’s ability to find beer anywhere, we do not think we could have had better travelling companions. And finally Andrew and Jeff. Over 7 weeks 30 cms apart, hours everyday. Still friends, a lot of respect for each other’s abilities! Magic!!!! Thanks to our sponsors also. Travel Directors, for all the visas and bookings of accommodation. It was a huge amount of work. Also a big thanks to Scarboro Toyota. C-YA did not miss a beat. Not even a flat tire! What a great car! Lastly, to all our blog and facebook followers. We have read all your comments! We hope you have enjoyed sharing this with us! Message:C-YA has arrived at this location. Oh what a feeling! You have received this message because khanonaussie has added you to their SPOT contact list. Our stay overnight at Arvaikheer was a memorable one. 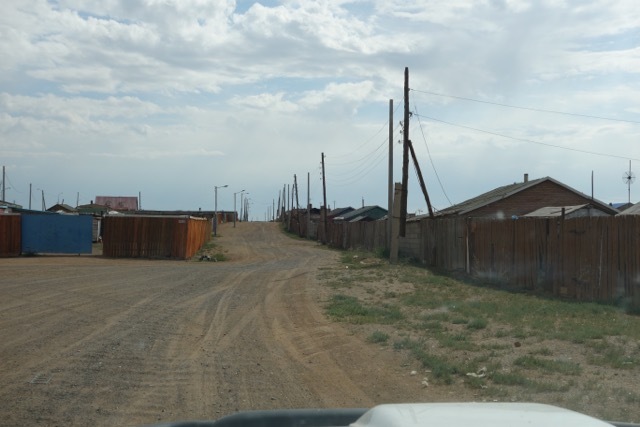 The “Time” hotel was the highly rated one in Lonely Planet in this Gobi border town that is on the main southern route across Western Mongolia. When we checked in, we found we were the only guests apart from a late expected arrival of a motorcyclist. There was no wifi, some rooms had no working showers, and no english was spoken. However, it was clean, it looked like rain overnight, so this was it for the night. After unloading our gear from the cars we were approached by Frank. He was a retired hospitality person from Germany who had volunteered to travel toMongolia and teach the basics of the hospitality industry to Mongolians. He just happened to be at our Time hotel at the moment and offered to look after us during our stay as he acknowledged that the local staff, although well meaning, had nothing prepared for guests. He asked us what we would like for dinner and said to give he and the staff 90 minutes and they would have things ready for us.How lucky were we! A cold beer was available and we sat down to refresh and plan the next day’s drive. At 8pm, it all arrived in the little white table-cloth restaurant! A fantastic vegetable soup with ingredients bought just an hour before, followed by a chicken and onion casserole with stacks of butter roasted potatoes and a salad. They even found some wine. There were 2 bottles of red wine in the hotel. A German Rottwein. We had them both! Initially they brought out thimble sherry glasses for the wine but Farnk taught them the art of being a sommellier whilst we were there. Whilst eating, our motorcyclist guest arrived, an Austrian called Wolfgang, who was taking 4 weeks off from his tourist company in the Philippines to travel around Mongolia on a rented 600cc Yamaha off-road bike. He shared our wine as we exchanged experiences. Repleat, we retired to our rooms for the night after Frank had planned our breakfast for the morning. After a morning feast of eggs, cheese, fried bread (no toaster), and lots of chai, we said goodbye to Frank, Wolfgang and the lovely people at the Time hotel and set off for the Gobi! As we headed south, the roads became dustier, the tracks became more subtle and difficult to find, but the views did not fail to impress. 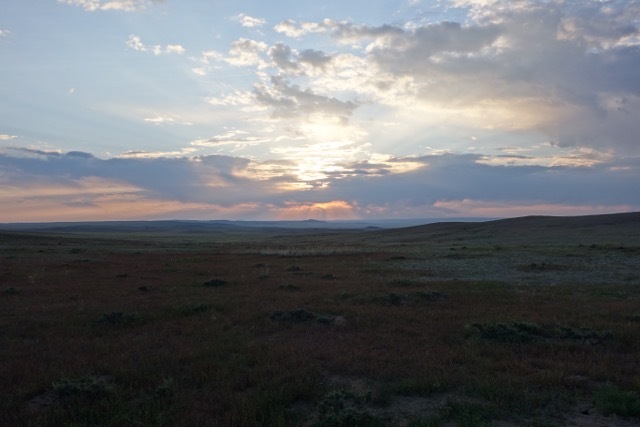 This part of the Gobi is so flat, with absolutely no trees, not even a bush more than a few cms high. Just the very occasional tuft of grass and the odd waterhole or small lake where gers, animals and their herders can be found. The usual Ovoos can be seen at the top of small hills, again both for navigation and for spiritual reasons. Andrew ran around one 3 times for luck as is traditional. We might need it to find our way out of the Gobi. 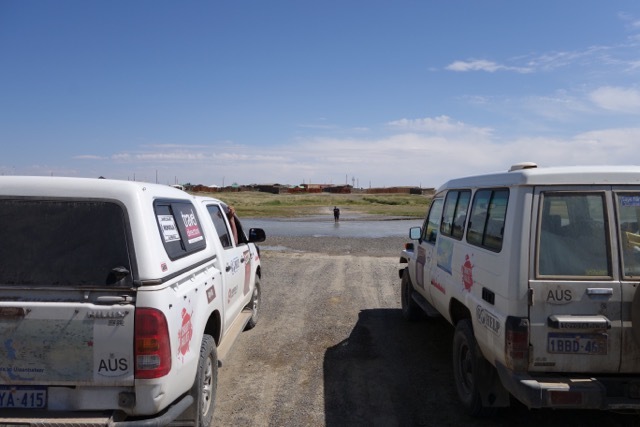 We got to the small town of Saikhan-Ovoo, where we had to cross a small stream to get into town. No bridges here! After another hour we stopped for lunch. The sun had some bite and there was a warm wind blowing, so we set up a tarp for shade between the two vehicles and had a great meal in the cool. 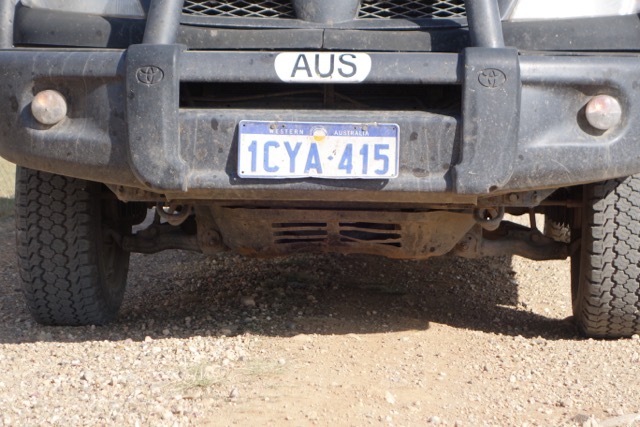 It was interesting to look at the sump guard of C-YA. She has good ground clearance but there were some good dents in it! We still had 60 or so kms we wanted to do before dusk as we wanted to get closer to the main road to Ulaanbataar for the next day. The tracks continued to be confusing, winding, diverging, sometimes leading us in the wrong direction before we corrected by setting off cross country again using our GPS to find the correct track! 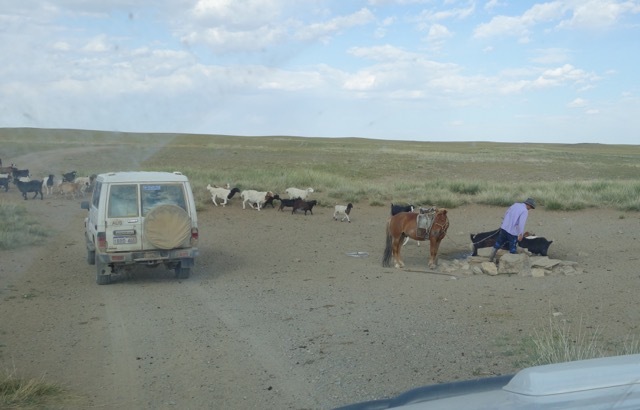 We went past the occasional well where we found herders using buckets to draw water into a trough for the animals. Finally, it was time to bed down for the night. We set off 1 km off the road looking for a ridge to shelter us from the warm wind. Pete found a great spot and we began to set up camp miles from anywhere, or so we thought! We had only just begun to put up our tents when we heard the engine of a motorbike coming over the ridge. It was a local herder who had spotted us and was coming over to check us out. This area of the Gobi is not tourist territory so we were a curiosity. 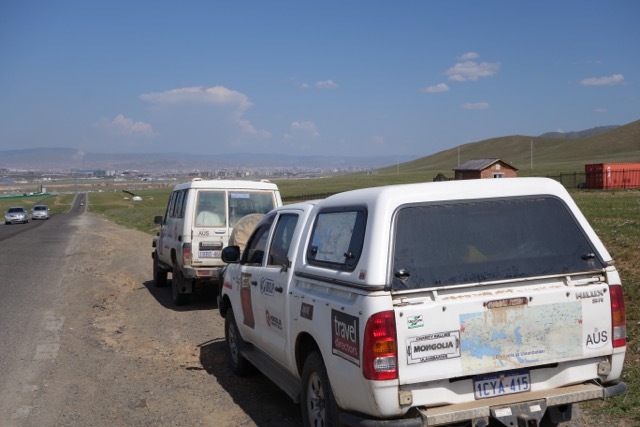 It was the usual, no english on his side, no Mongolian on ours, but we greeted, smiled, gestured to our map to explain what we were doing and he then watched us set up camp, curious as to all we were doing. We offered him some soft drink which he gratefully accepted. Then he watched us cook dinner and we prepared a meal and shared this and a beer with him! It was a special treat to return some Mongolian hospitality. He then bid us “thank you and goodbye”, the only words of english he knew and set off for his ger just before sunset! 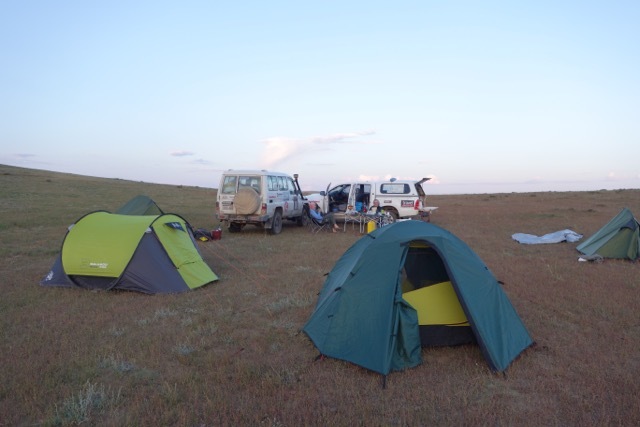 We had a great night’s sleep in the quiet of the Gobi. A few large drops of rain began to fall overnight but they did not last and we awoke to a beautiful sunrise with everything dried out by the warm wind! At breakfast we saw our herder friend again on a hilltop using his binoculars to check out the countryside and he then drove down to see us. We shared a chai with him and, as this was our last night camping, we gave him a frypan, plastic containers and a whole bag of coffee that had not been used, as well as some toys for his children! He was so happy. He shook our hands, stuffed it all under his tunic and rode away waving! 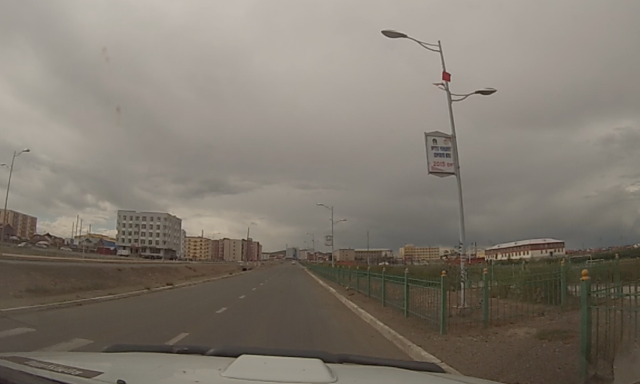 Another 50 kms of sandy winding roads beckoned and we hit the town of Mandalgovi and the sealed road to Ulaanbataar. A few hours later, there we were, UB in the distance. Ulaanbaatar, literally “Red Hero”, is the capital and the largest city of Mongolia. An independent municipality, the city is not part of any province, and its population as of 2014 was over 1.3 million. Located in north central Mongolia, the city lies at an elevation of about 1,310 metres (4,300 ft) in a valley on the Tuul River. It is the cultural, industrial, and financial heart of the country. It is the centre of Mongolia’s road network, and is connected by rail to both the Trans-Siberian Railway in Russia and the Chinese railway system. It was strange to see a bustling, high rise, traffic jammed city again. We found our hotel, the Kempinski, and settled in for a few days of luxury. We needed to clean and prepare C-YA for handover to the charity. But first it was a bath for us, wonderful! Andrew washed some of his clothes in the bathtub and the water was a muddy brown afterwards! The Gobi is a dry dusty place.